I've been playing around with looper pedals for few years and during that time my perception of loopers and live looping in general has changed. First I thought that loopers were tools for practicing and jamming. Then after awhile I started to understand that live looping could be much more than just jamming and loopers could be used to create complete live performances. Like everything in life, things only look simple on the surface level and when you go deeper into the subject it gets more complicated. Live looping is an art form that requires serious practicing if you want to get it right. I'm not an expert in live looping and nowhere near the level of some players out there (Phil Keaggy, Bill Frisell, Jarle Bernhoft etc.) but during the last few years I have learned a thing or two about looping and I would like to share them with you. Another reason for this little article series is completely selfish: writing things down is a good way to process ideas and sort them out in your own head. So, this is a learning process for me too! :) Let's get started! According to Wikipedia live looping is "the recording and playback of a piece of music in real-time using either dedicated hardware devices, called loopers or phrase samplers, or software running on a computer with an audio interface." The key point here is that musical parts (loops/phrases) are created and recorded live. Sometimes pre-recorded loops or samples are also being used as a part of the performance. Using a looper allows the performer to layer complex musical parts and compose a complete piece of music in real-time. Why should I use a looper? First of all, I think that loopers are perfect tools for practicing. Using a looper pedal forces you to develop your inner sense of time because you can immediately hear if the timing of the loop is off. You have to be able keep up the given tempo and then get to the loop point (the point where loop ends and cycles back to beginning) just right. I feel that using a looper pedal has really pushed me forward with my playing and especially helped me with my sense of rhythm and groove. Probably the most important factor is that live looping is super fun and you can easily jam/practice for hours. Loopers are also fantastic tools for composing new music: layering guitar parts is fast and you can test out new ideas in seconds. Looping is spontaneous and immediate in nature and this really feeds my creativity. Working on guitar arrangements is also efficient since you can immediately hear if something works or doesn't work. This is important because good arrangement is also good mixing. You can save some time and make the mixing stage easier by focusing more on the arrangement. If the song is well arranged, you can basically just lift the mixer faders up and it will sound good and balanced. Don't fix it on the mix! Why do I think that loopers are especially good for revealing bad arrangements? Well, in a pretty standard situation a looper pedal is used with one guitar amp and the sound is monaural/mono. With this kind of setup, layering two (or more) different guitar parts so that it doesn't sound like Scheiße is a real challenge. It makes you focus on the arrangement! Even though loopers are good tools for practicing and composing they are also excellent for live performing. In a perfect situation the looper is so seamlessly integrated to the performance that the music just flows out and you don't notice the performer layering loops. I think that Jarle Bernhoft is a good example. His looping (and playing) looks effortless and songs develop naturally: moving from one section (verse/chorus etc.) to another is seamless. This is one of those things that separates professionals from rookies. I think that developing that kind of fluency requires that you approach live looping from a different angle. Ethan Tufts (aka State Shirt) sums it up in his article: "If you want to take your looping from four-bar bedroom jams to a performance environment, start thinking of your looper as an instrument, not an effect." Whatever your personal goals are in guitar playing and as a musician, using a looper pedal will make practicing and playing more fun. You will play more and thus develop faster. 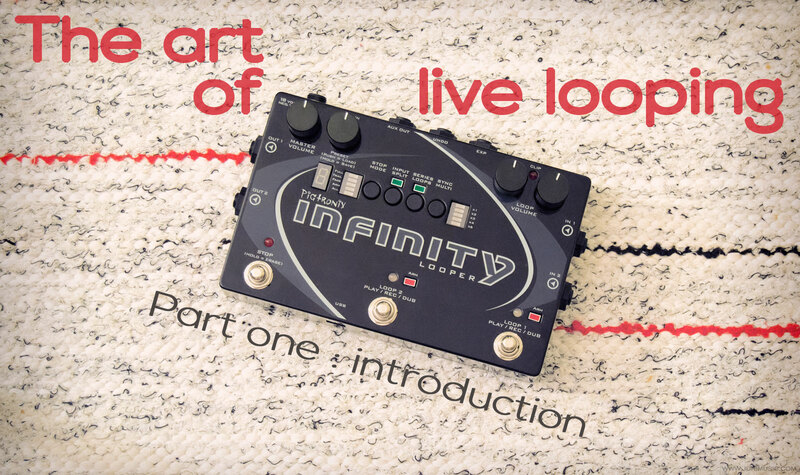 The next article focuses on live looping in practice. I will give some useful tips and tricks that will take your looping to another level. Stay tuned and keep on looping! :D Yeah, I'm gonna start writing the next part asap!